I didn’t know how I’d feel about Las Vegas. I’d spoken with plenty of people who’d visited, and their reactions were always extreme. Some people loved the place-- for the neon, the noise, the outrageous luxury of the mega-casinos, the gluttony of the breakfast buffets, the glamour of the show spectaculars, the illicit sensation of gambling ... Others hated it--for the same reasons. I’d all but decided that I wanted my third “Good Thief” mystery to be set in Sin City, and my first visit was going to settle things for good. It was New Year’s Eve 2007, soon to be 2008, and my fiancée and I were booked into the Luxor Hotel--a tinted-glass pyramid with a laser at its peak that’s powerful enough to give the Death Star weapon-envy. The shuttle bus ride from McCarran Airport had taken us to our lodgings via the MGM Grand Hotel, New York-New York, and the medieval Excalibur. During that journey, a British boy in the seat in front of us had clambered towards his window outside New York-New York, goggle-eyed at the giant roller coaster that coiled around the landmark skyscrapers, and announced that it looked like Disney World. He sounded excited. He wasn’t alone. The first two “Good Thief’s Guides” were set in Amsterdam and Paris, respectively, and it had always been my hope to take Charlie Howard--mystery writer and hapless burglar--Stateside for book three in the series. In part, that was because of my long-held fascination with the USA--I took a degree in American Studies, and many of my favorite writers are American. But it also had to do with speed. I wanted everything in the third book to happen at pace. I wanted Charlie to get into trouble on vacation, when he was unfamiliar with his environment, and I wanted that trouble to be fast and extreme. Vegas struck me as both of those things, and more besides. Before I’d even checked into my room, I knew it was perfect for Charlie, even if it wasn’t ideal for me. Three months later I was back, spending a clutch of nights at the Venetian as part of my honeymoon. By now, I was working on a plot, scouting for ideas. The first one came to me when we checked into our suite. I was putting our valuables inside our hotel room safe, and I happened to notice something unusual (at least to me). You could lock the safe by entering a four-digit code, but you could also lock it by swiping your credit card through a reader on the fascia of the safe. It struck me as pretty secure. Until I thought about it some more. Say my wallet got stolen. Say it contained the key card to my hotel room (along with the nifty cardboard sleeve that had originally contained my key, and that happened to list my room number). Well, wouldn’t that mean that someone could get inside my suite and try a bunch of my credit cards in the hope that one of them would open the safe? A lot of the Vegas movies and novels I’d been enjoying as part of my research were about major casino heists--overblown crimes in an overblown place--and I started to think it would be interesting to invert that classic narrative by exploring a petty crime that spiraled out of control. So Charlie would steal a wallet at the beginning of the book, and from there he’d access a hotel room, and from there a safe ... But whose wallet should he steal? I needed a victim who wouldn’t generate too much sympathy. By now, we’d left our suite and were taking a walk through a nearby shopping mall. Inside the mall was a cramped theater--maybe not the type of place your average wannabe dreams of performing. A magic show was about to start. There were tickets available at a knock-down price (funny, that). My wife and I figured we’d kill an hour or two, and went inside. The show had been billed as comedy magic, and it was--except the parts that were meant to be funny, weren’t, and the parts that were meant to be thrilling were unintentionally hilarious. At one point, the magician beckoned a teenage boy up on stage as a volunteer for one of his tricks, but instead of being wowed, the boy saw the magician cheat. He called him on it in front of the entire audience. The kid refused the gifts being offered to him--a set of DVDs of the magician performing--unless the magician confessed to what he’d done. The magician refused, the kid was shuffled off stage by a leggy assistant, and the show stumbled on--but the episode stuck with me, and that bumbling magician grew into the character of Josh Masters, “star” magician at the Fifty-Fifty casino-hotel. Not heard of the Fifty-Fifty? That’s because I made it up. 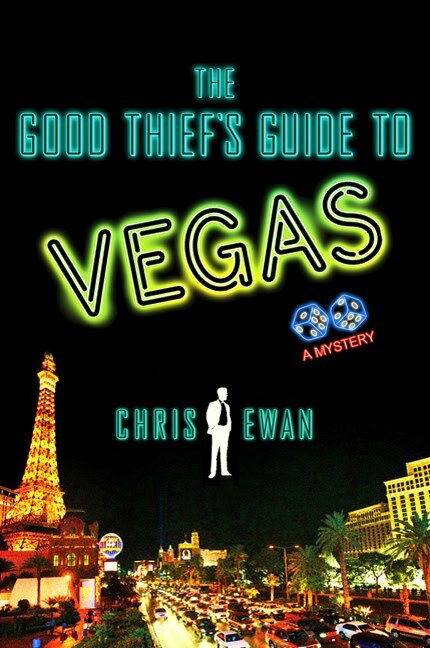 I mentioned research, and I’d been reading a bunch of books about Las Vegas--its mob history, its spectacular growth and development, the infamous attempted thefts and (allegedly) successful gambling cons that had been visited upon it. All of it was fascinating, but one thing interested me in particular--the resort hotels themselves. From the daring gamble of the Flamingo, through the Rat Pack days of the Sands, to the family-themed Circus-Circus, and modern behemoths like the Mirage and Bellagio, right up to the recently opened City Center development. Each hotel resort had become more ambitious and more outlandish than the last, and I figured I’d have a go at constructing some casinos of my own--imaginary ones that I dropped onto the plots currently occupied by the Imperial Palace and Bally’s, and a square of vacant dirt next to the Mandalay Bay. So the Fifty-Fifty is based on the theme of 1950s America, with the casino floor dedicated to a noir world of cops and gangsters; Space Station One is a spaceship-themed hotel; and the Atlantis-Las Vegas is a hotel-water park on the skids. After all, in a world of hourly exploding volcanoes and scheduled pirate battles between scantily clad lingerie models, anything is feasible, right? All of this thinking about hotels led to two things: one, the idea of creating a scenario where Charlie had to break into as many hotel rooms as he possibly could, and steal as much as he was able to, in a period of 24 hours; and two, an awareness that lurking behind some of the most notable hotels in Las Vegas have been some pretty notable property moguls with (whisper it) murky pasts. Maybe, I thought, one of these moguls could become a fitting adversary for Charlie? Well, fine, but I mentioned that one of the things that had attracted me to Vegas were the extremes that could be found there. So I decided to create two hotel moguls--a pair of identical twins. And while I was at it I threw in a dead showgirl, a circus giant and a dwarf, and a private detective with a specialty in investigating gambling irregularities. I mean, small crimes are all well and good, but I couldn’t write a book about Sin City without a gambling con, and my research had taught me a couple of corkers. This was where Charlie’s literary agent and friend, Victoria Newbury, would come in, and where I could finally reveal a dark secret about her past. Oh, and then there was the Houdini angle to explore. In 2004, a collection of Houdini memorabilia had been auctioned off at the Liberace Museum on Vegas’ East Tropicana Avenue, and it occurred to me that Josh Masters might have been tempted to buy an item or two. More research beckoned. So that was trip two, but I still had one visit left. This is the way I work with my “Good Thief” novels--three visits for each city I write about (a drag, I know). The final trip took place the following spring, when I was polishing the manuscript during a stay at the Bellagio. This time, I looked for details--ways to better conjure a sense of Vegas, perhaps by mentioning some of the tunes that accompany the dancing fountains out on Lake Bellagio, or the confetti of call-girl cards that litter the sidewalks between hotels. I visited the casino floor and got the knock-back from the hotel security team, who were curiously reluctant to discuss room thefts with me. I took a drive out to Mount Charleston, where people were snowboarding on the fringes of the desert, and a detour back through Naked City in the shadows of the Stratosphere Tower. I ate a meal in the ersatz St. Mark’s Square in the middle of the Venetian--where the final scene of my novel is set. I played rapid roulette and blackjack in Paris-Las Vegas, losing comprehensively. My wife won big(ish) on a giant fruit machine in the Mandalay Bay. I guzzled a champagne buffet, flew to the Grand Canyon, walked beneath the gaudy neon canopy above Fremont Street. And you know what? I became one of those hopeless fools who falls hard for Las Vegas. I’d return tomorrow in a heartbeat. Oh, what a splendid book this was too--recommended with great vigor!